The design with overlapping cylinders reduces the overall boom transport height to 3.5 m for 580ST and 3.7 m for 590ST and 695ST. The variable displacement pump combined with Tier 4i engine reduces fuel consumption by up to 14%. The 4,5 litre FPT engine with high power and torque density dramatically reduces service time ensuring the lowest maintenance costs in the market. All the main check points are easily accessible from the ground. 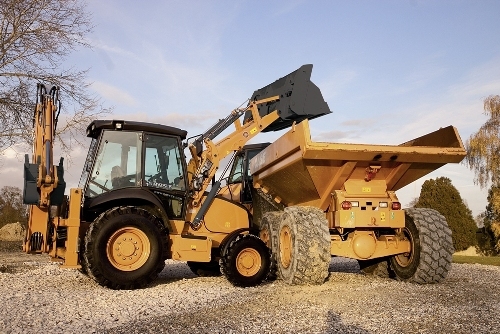 Excellent visibility for all operations with loader or backhoe. Fully openable front and rear windscreens for excellent cab ventilation. The return to dig mode guarantees precise automatic loader repositioning and easy to control loading operations. Auto Ride Control offers 3 settings to match different working conditions. The patented integrated hydraulic quick coupler allows changing over the backhoe attachments from the cab with a simple switch. The hydraulic side shift enables easy and quick backhoe replacement in all work conditions. Case straight loader arm ensures highest loading capacity in the market combined with best-in-class tipping height. The outer extendahoe is the perfect solution for tough working conditions: the sliding part never touches the soil preserving its efficiency. The gripper teeth provide an excellent material retention.